213 SINGLE SCOTSMEN There was something about the Brigadoon-like Falgannon, something that kept most of its male inhabitants unwed. From Michael the Story to Callum the Bicycle—and we mustn’t forget The Cat Dudley, the slyest poker-playing moggie in the Outer Hebrides—every male of the Isle had happiness dependent upon that of its Lady. So things had been since Pictish times, and so they would be long after the present day. Despite her machinations, to this point B.A. Montgomerie had been unable to make her men happy. Her first marriage had been against their advice; her husband had been an Irishman, true, but he had failed to meet other necessary requirements...and things had ended badly. Now, another Irishman had come—and was making the natives restless. 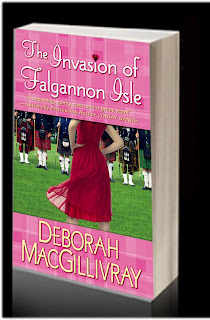 Yes, the men of Falgannon could sense Desmond Mershan’s conquering Viking spirit and his desire for B.A.—which B.A. could sense herself. And while her men would never let anything happen that she didn’t want, this Irishman had come to pillage and loot, and nothing was going to stop him. Staring into his vibrant green eyes, B.A. anticipated the battles to come. To enter for your chance at an autographed copy of today’s Book of the Day, check out the Contemporary authors on AuthorIsland to find out who is the happy mother of four kids. Email your guess to AuthorIsland at yahoo.com, along with your name and address and please put "Book of the Day" in the subject line. Good luck!